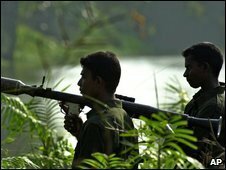 Exiled political activists of Sri Lanka's Tamil Tiger rebels say they will form an international government to pursue their political demands. They plan to hold elections across the Tamil diaspora within six months to form an international government. In a statement the activists claim this government would campaign for a homeland based on self-determination. It is the first major statement from the rebel group since the capture of their leader, Selvarasa Pathmanathan. As before, they say they will set up what they call a Transnational Government of Tamil Eelam, based across the countries where there are diaspora communities. But they now also say they are planning elections to that government by next April, with a full electoral commission and country committees drawing up voter registers. They are highly critical of the situation inside Sri Lanka, saying they seek to end what they call the Sri Lankan government's "acts of revenge" on Tamils and its "plundering of the resources of [their] homeland". Their rhetoric is strong - they refer to the government's "Sinhala-Buddhist genocidal forces". But they have repeated that their new approach will be political, not violent. That is unlikely to soften the attitude of the government here, which has made it clear that it is now hunting the Tamil lawyer who has signed this document, Visvanathan Rudrakumaran. This statement does not make it clear how all their plans will be logistically possible. But the group is clearly still wedded to the idea of a separate homeland, which many observers consider to be defunct after their military defeat.